Ubisoft has announced a GIF contest alongside the new Rainbow is Magic event, which will be open from April 1 to April 8‒the same days the event will be live. In the news post, Ubisoft also detailed how to enter the contest. Contestants must make a GIF with two themes in mind: Magic and Tacticute. Contestants should also watermark their GIF entry, or attach their name to the GIF in some way, per Ubisoft’s guidelines. Fans can submit their GIFs via social media posts on Facebook, Instagram, and Twitter. Be sure to use the hashtags #R6GIFContest and #RainbowIsMagic. If you don’t, your entry may not be seen by Ubisoft. So, what’s your reward for your magical GIFs? 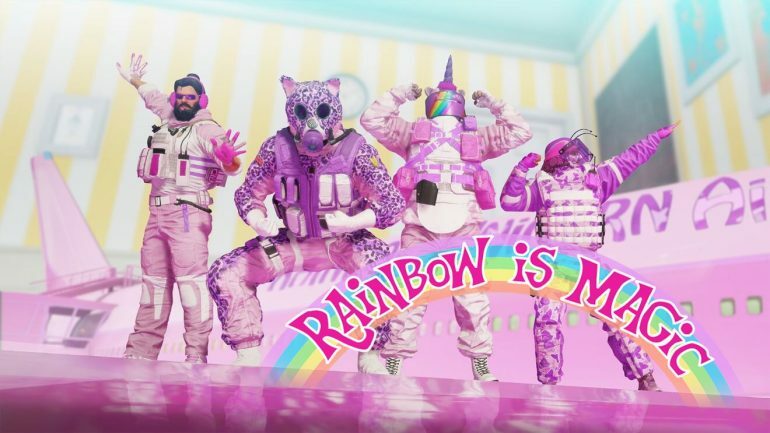 The 10 selected winners will receive the full Rainbow is Magic cosmetic collection, which is otherwise bought with R6 Credits, or grinded out through challenges. Winners will be decided by whether they followed the required themes, how creative each contestant is with their GIFs, and their GIFs originality, according to Ubisoft. Each winner will be notified via the social media account they used to post their GIFs.